A homogeneous film deposited on 85 to 98% alumina ceramic rods. Nickel plated caps are fimly pressed on the metallised rods. A special machine is used to achieve the highly precise resistance tolerance by cutting a helical groove in the film layer. Tin coated electrolytic copper wire are spot welded to the center of the termination caps. 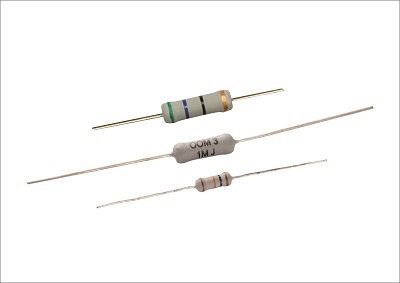 The resistor are coated with flame proof epoxy for electrical , mechanical and climatic protection,colour codes are applied with respect to designated value on coated Resistor.All Resistors are subjected to tesing before final taping process.